Christian theologian and missionary to the Jews; born at Vienna, of Jewish parents, March 7, 1825; died at Menton March 16, 1889. He embraced Christianity in 1846, and was for some time a missionary to the Jews in Jassy, Rumania. After having been successively a Presbyterian and a member of the Free Church, he joined the Episcopalians, settling at Oxford in 1882. His last ecclesiastical appointment was that of vicar of Loders, Dorsetshire, which he resigned in 1883. 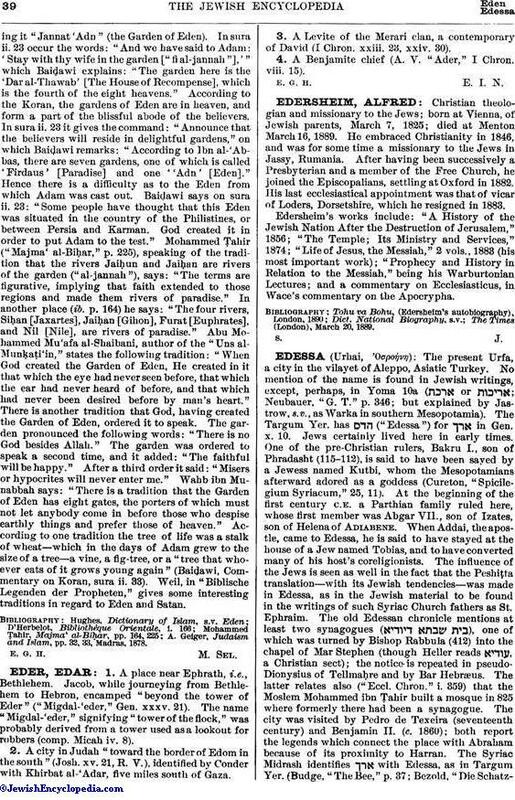 Edersheim's works include: "A History of the Jewish Nation After the Destruction of Jerusalem," 1856; "The Temple; Its Ministry and Services," 1874; "Life of Jesus, the Messiah," 2 vols., 1883 (his most important work); "Prophecy and History in Relation to the Messiah," being his Warburtonian Lectures; and a commentary on Ecclesiasticus, in Wace's commentary on the Apocrypha. The Times (London), March 20, 1889.